Many valuable magnetic materials can be recovered from end-of-life (EOL) waste, in particular from permanent magnets. Permanent magnets (PM) containing rare earth elements (REEs) such as Dy and Nd offer better performance with respect of non-REE containing magnets in terms of power relative to size. The cost of the recovery process, depending of the market price of raw materials, can become competitive in particular socio-economic global conditions (see the 2011 global crisis for REE), this is why an effort is currently made worldwide for optimizing processes for effectively separating and recovering the rare earth elements that can be used by the permanent magnets producer industries. Currently in the CNR laboratory of Rome a new hybrid and cost effective process to recover rare earth elements from PM has been developed in collaboration with the SME RECMIR. 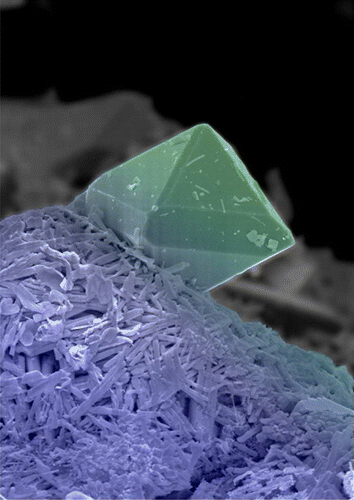 SEM image of a Nd(OH)3 crystal.